This dialog can be opened by clicking on the related menu item in The Tools Menu or by clicking on the icon in the materials bar (see The Main Window User Interface). With this dialog you can find a specific material and its related faces and replace this material by another one. Material field: Name of the material to search for. Browse opens The Material Browser. 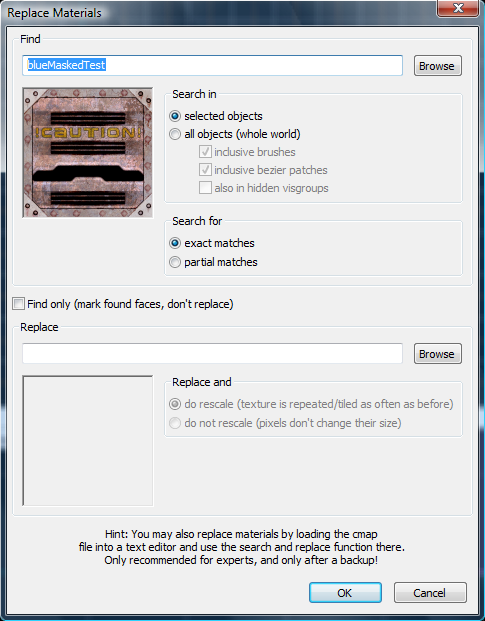 selected objects: Searches only in the currently selected objects for faces with the material to find. all objects (whole world): Searches in all map objects. inclusive brushes: Includes brushes into the search. inclusive bezier patches: Includes bezier patches into the search. also in hidden visgroups: Includes invisible objects into the search. exact matches: Only materials that match the exact material name given in the material field are found. partial matches: Materials whose names match the searched material name partially are also found (e.g. search name: wall; partially matches with wall_01, mywall, etc.). Find only: Found faces with the specified material are selected but the material is not replaced. Material field: Name of the material to replace with. Browse opens The Material Browser. do rescale: The replacement material is rescaled in the same way as the old material. do not rescale: The replacement material is applied without rescaling.